Mohawks at Tyendinaga, April 2008. HALIFAX – They block roads, stop trains and fight the cops. Men and women dressed in camouflage, boots and bandanas. They come from reserves, wave red flags, set fires, tear up roads and declare sovereignty for their tribes. They are the so-called ‘Warrior Societies’ and they mean business. They even award themselves ranks such as general and lieutenant, insisting a military wing is a part of any sovereign nation. Many aboriginal rights activists consider themselves as members of a sovereign people, separate from Canada. Many arrested at a recent riot in Rexton, N.B., where six police cruisers were torched, are members of the Mi’kmaq Warrior Society. Charges range from possession of a firearm to unlawful confinement and uttering threats. Dressed head to toe in combat fatigues, Susanne Patles was released on a $400 bond and talked to reporters outside court and explained where their anger was coming from. And, while the claims, though rooted in history, might be spurious to many across the country, Canada’s security agency has taken the warriors seriously for a long time. Initially connected to the extremist Native movements in the U.S., such as Red Power and the American Indian Movement (AIM) in the 1970s, the Canadian movement really took root in the 1980s. 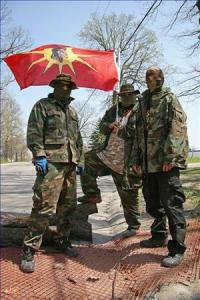 Most Canadians first saw the red warrior flag during the Oka crisis in Quebec in 1990, when Mohawks — and their warriors — blocked access to a burial ground set to be developed into a golf course. Douglas Bland, a retired lieutenant-colonel with the Canadian military, offered similar warnings in his 2009 political thriller, Uprising. Bland says warrior societies are paramilitary organizations with easy access to weapons and explosives and believe they have the moral high ground. Such a scenario is not out of the question. The Idol No More movement, that shook up the Canadian economy with rolling blockades and other damaging protests in 2012, showed the disruptive power of Native militants. 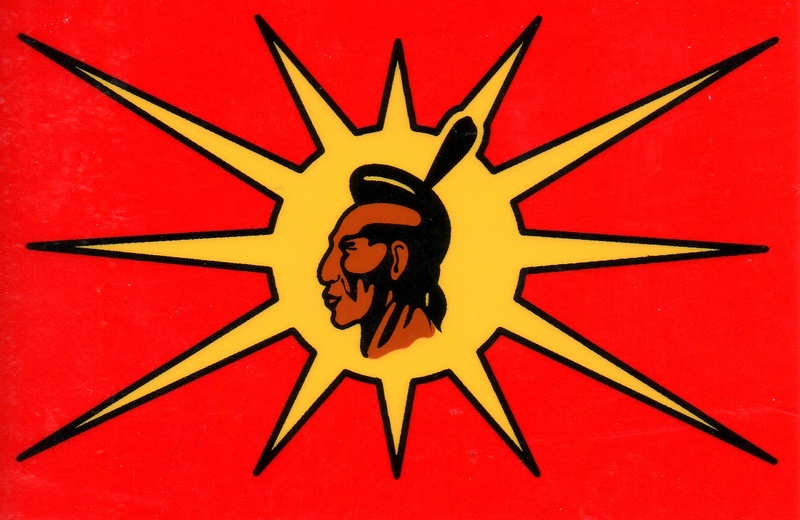 The “warrior flag” was painted by Mohawk artist Louis Hall in the 1970s. Hall was born in Quebec on January 15, 1918. His writings include the Warrior Handbook which calls on all First Nations to band together and assert sovereign rights. Posted on November 3, 2013, in Warrior and tagged Indigenous resistance, Mi’kmaq Warrior Society, native blockades, native protests, native resistance, Warrior Society. Bookmark the permalink. 2 Comments. Typical of immigrant Canadians self serving media. We must as Indigenous people assert our inherent rights through our hereditary leaders, not through elected half breeds like Nepinak whose positions and perceived authority are derived from the Indian Act. Same goes for any elected or appointed chief, councillor, elder or senator with the SFN, tribal councils, bands , provincial, treaty or regional organizations..they are part of the problem and not part of the solution. Same goes for self or community appointed warrior chefs, grand chiefs, healers or any of our people ignorant enough to be in a federal, provincial, municipal , regional or civic government or non Indigenous security or armed forces. Time for clanmothers and lifetime chiefs to assume leadership and direct us through our own laws that still exist, were never extinguished or ceded.